Summer is on its way and we’re all hoping for a generous rainy season. 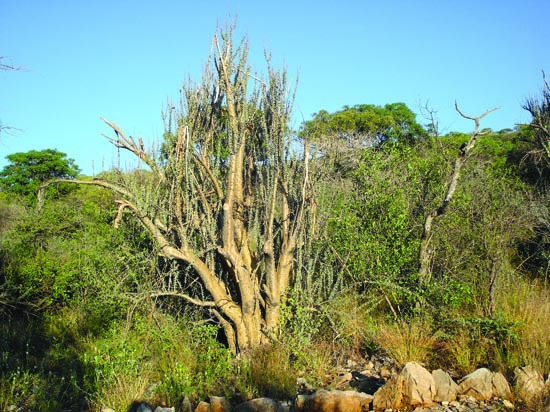 Fortunately most Namibian trees and shrubs are well adapted to our irregular rainfall, and at the beginning of the summer season yield leaves without receiving that much water. As in earlier articles under this heading, the trees and shrubs around the bungalows, campsites and along some of the hiking trails of the tourist destinations mentioned have been identified and tagged with the Southern African tree numbers. The botanical name appears at the back of the tag. Ask for a list with the numbers, botanical and common names in English, Afrikaans and German at the reception of your lodge or camping establishment. 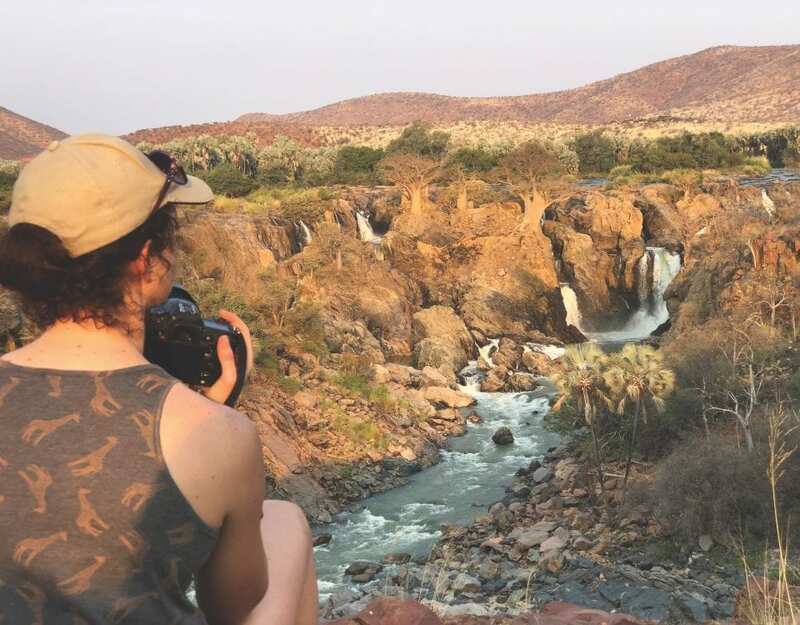 The tourist accommodation establishments named in this article are situated close enough to Etosha to enable you to drive into the park in the morning and out in the evening. Some of them even provide guided tours of Etosha. Situated 20 km east of Namutoni (10 km from the Von Lindequist Gate entrance) and offering game drives into Etosha, the Mushara Collection comprises Mushara Lodge, Mushara Bush Camp and Mushara Outpost, all under thatch. Mushara Lodge offers 10 bungalows, one family house, a room with three beds, two single rooms and two exclusive villas that provide complete privacy. The Bush Camp consists of 16 well-equipped tents, and at the Outpost there are eight tents on wooden platforms. All three establishments are beautifully positioned, serve excellent food including delicious meat and vegetable dishes, and provide efficient and friendly service at all times. In total 35 different shrubs and trees have been tagged at Mushara. At all three locations the purple-pod terminalia (550) (Terminalia prunioides) is by far the most common species – in fact ‘mushara’ is the Oshiwambo name for this shrub or tree, which is very conspicuous in autumn when covered in flat two-winged dark-purple pods. Quite often you will find the creamy flower spikes on the same tree with the pods of an earlier flower flush, creating a very colourful contrast against the dark green foliage. The tall dark-stemmed tree with drooping foliage is the tamboti (341) (Spirostachys africana), well known for its scented wood, which may be placed among clothing to keep out moths and other insects. 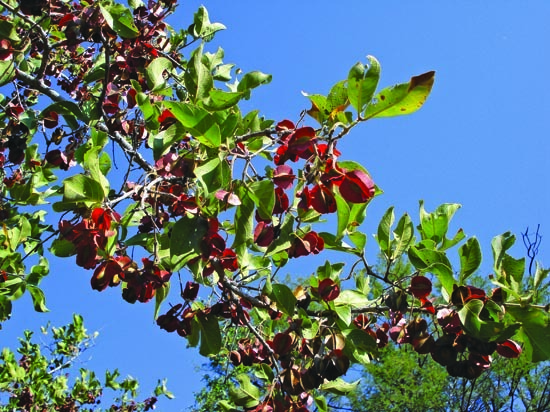 Trees with four-winged fruit and smooth, shiny green oval leaves with sharp, often twisted points are known as kudu-bush (532) (Combretum apiculatum subsp. apiculatum) since they are readily browsed, not only by kudu but also by many other game species. These three species are very typical of all the localities mentioned in this article. The young manager, Donsie Schoeman, is very friendly and enthusiastic about running his camp. He is an excellent camp cook, and meals can be pre-ordered. Twenty-one different species of shrubs and the trees along the hiking trail at the edge of the terraces have been identified and tagged. Both the shepherd’s tree (122) (Boscia albitrunca) and the smelly shepherds-bush (124) (Boscia foetida) can be found here. The latter owes its name to the fact that its flowers have a very unpleasant odour. Not to fear, however – they don’t grow near the campsite or bungalows. The leaves of the bird plum (449) (Berchemia discolor) have a distinct fishbone venation, and the yellowish fruits are edible and very sweet. Much of the undergrowth consists of three different species of raisin bush – sandpaper (459.2) (Grewia flavescens), and mallow raisin (463.3) (G. villosa), and small-leaved cross-berry (463.10) (G. tenax). The fruits of all of these are edible and quite nourishing. However, compared to raisins, they are very dry with large pips covered by a thin layer of desiccated flesh. Located 11 km north of Outjo off the Kamanjab road, Matunda Guest Farm is a comfortably equipped and affordably priced guest farm without excessive luxury. Accommodation is in five rooms with a total of 12 beds. Citrus fruit and vegetables are grown organically. Michael Jentzsch, the owner, is an accomplished cook and conjures up delicious meals. A total of 37 shrub and tree species have been tagged here, seven of which are exotics often found in Namibian gardens. North-western Namibia is well known for a large diversity of corkwood trees, and a healthy example of the velvet-leaved corkwood (280) (Commiphora mollis) can be seen right in the yard. A spreading dark-green Natal mahogany (301) (Trichilia emetica), occurring naturally only in the Eastern Zambezi Region (formerly Caprivi), provides shade in the garden. A well laid-out hiking trail leads up a dolomite hill through open woodland behind the homestead. It features a large diversity of woodland shrubs and trees, most of which are found only on hills and among rocky outcrops. The wild grape (D8) (Cissus nymphaeifolia), with large, almost round toothed leaves and red grape-like fruit, is a climbing shrub. 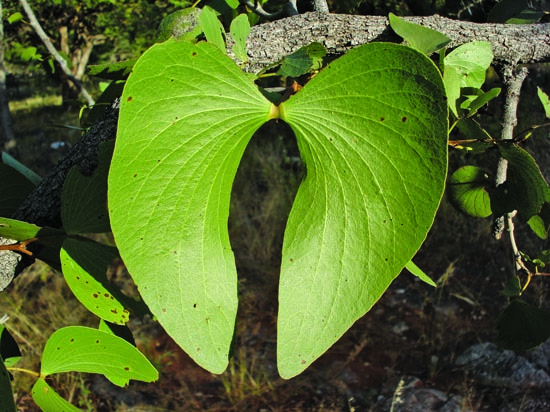 The butterfly-leaf (208) (Adenolobus garipensis), often a severely browsed shrub, occurs as a tree here, identifiable by its blue-green bilobed (two-lobed) leaves. The python vine (F4 ) (Fockea multiflora) may be a shrub, a small tree or quite often a strangler, and could well be the strangest plant found in this area. The strangler tendrils twine high into other woody species, snake along the ground until they find a tree to support them, or form a very large bulbous stem. The large, obscurely trilobed leaves of the propeller tree (120) (Gyrocarpus americanus) turn yellow to bright red before dropping quite early in autumn. The two-winged capsules develop after the leaves have fallen and are an unmistakeable feature of this tree. The Namib coral-tree (243) (Erythrina decora) is endemic to Namibia and grows only on hill slopes. Its flowers are similar to those of the coral trees found in many gardens in Windhoek. The fruit is a dark, woody pod, conspicuously constricted between the red bean-like seeds with a black spot at the point of attachment. This tented lodge, a mere 2 km south of the Andersson Gate (the entrance to Okaukuejo), is laid out in a circular pattern and enclosed by wooden palisades in the style of a traditional Namibian homestead. It offers 40 accommodation units, three restaurant seating areas, a bar with a large-screen television, two sparkling pools plus a kiddie pool and a fully-stocked utility and curio shop. The individual luxury canvas suites are constructed on raised timber decks, offering a spacious, fully air-conditioned bedroom with a unique kraal-like en-suite bathroom. 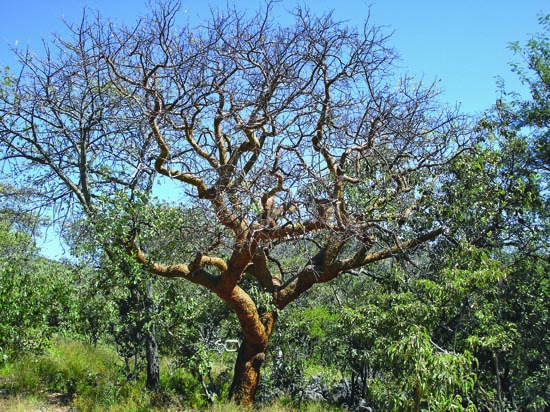 Twenty-one indigenous shrub and tree species have been tagged, including five different acacia species – yellow-bark acacia (164) (A. erubescens), red umbrella thorn (181) (A. reficiens), floodplain acacia (A. kirkii) (173), scented pod acacia (179) (A. nilotica), and three-thorned acacia (185) (A. senegal). Since the last-mentioned three are less commonly found, you will have a good opportunity here to inspect them at close quarters. The floodplain acacia has greenish-yellow to brown papery bark and the yellowish-brown seedpods have a characteristic pointed swelling over the seeds. The scented-pod acacia can be recognised by pods constricted between the seeds and a rounded bump over each seed. The green pod gives off an aromatic scent when crushed. True to its name, the three-thorned acacia distinguishes itself from all other acacias in Namibia by having thorns occurring in groups of three instead of in pairs. The corkwood family is represented by the blue-leaved corkwood (276) (Commiphora glaucescens) with blue-green leaves and coppery bark peeling in papery strips, the velvet-leaved corkwood (276) (Commiphora mollis) with softly hairy compound leaves, and the common corkwood (285.1) (Commiphora glandulosa) with shiny dark-green simple leaves. Only 10 km south of Andersson Gate, the western entrance to the Etosha National Park, Etosha Mopane Village offers accommodation in 15 eco-friendly dome-like canvas and wood chalets with solar energy and the African donkey system of providing hot water. The chalets are well spaced to give guests privacy, each with its own en-suite bathroom. This lodge opened during the first half of 2014. Screening walls and enclosures are constructed interestingly, using mainly local materials, such as the ubiquitous calcrete rocks. The six campsites have electricity, hot showers, private ablutions with a flush toilet and shower, and a private braai area, while a kiosk provides basic necessities. They are for self-caterers, while a braai-pack can be ordered from the lodge. The open-air dining area is under cover, and there is a communal boma area for evening campfires, a swimming pool and a restaurant. Fourteen indigenous shrub and tree species have been tagged here. The camp is situated on black soil and calcrete. The vegetation, dominated by mopane (198) (Colophospermum mopane), is somewhat stunted. Nevertheless, it offers a good opportunity to become acquainted with some of the species commonly found in Etosha, such as water-thorn (177.1) (Acacia nebrownii), kudu-bush (532) (Combretum apiculatum s. apiculatum), mouse-eared combretum (538) (Combretum hereroense), and the purple-pod terminalia (550) (Terminalia prunioides). The Namibian parsley tree (568.4) (Heteromorpha papillosa) has a strong herb-like scent, and flower and seed umbels similar to the well-known garden herb, while lekkervreet (K1) (Opilia campestris) may at times be hardly recognisable because it is a favourite browse of most herbivores, as implied by its Afrikaans common name lekkervreet, meaning ‘delicious to eat’. Of all the establishments mentioned in this article, Buschfeld Park Rest Camp offers the most for tree lovers, since it is surrounded by the greatest variety of indigenous trees and shrubs. 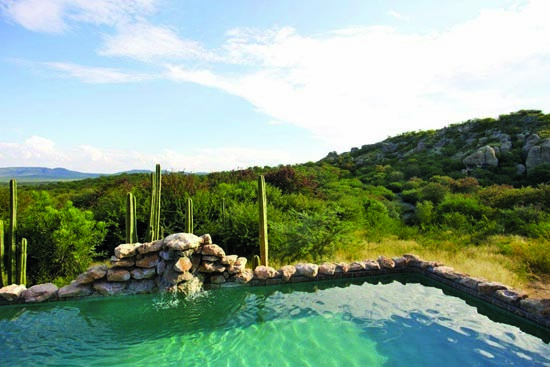 It is also ideally situated along the road to Etosha. 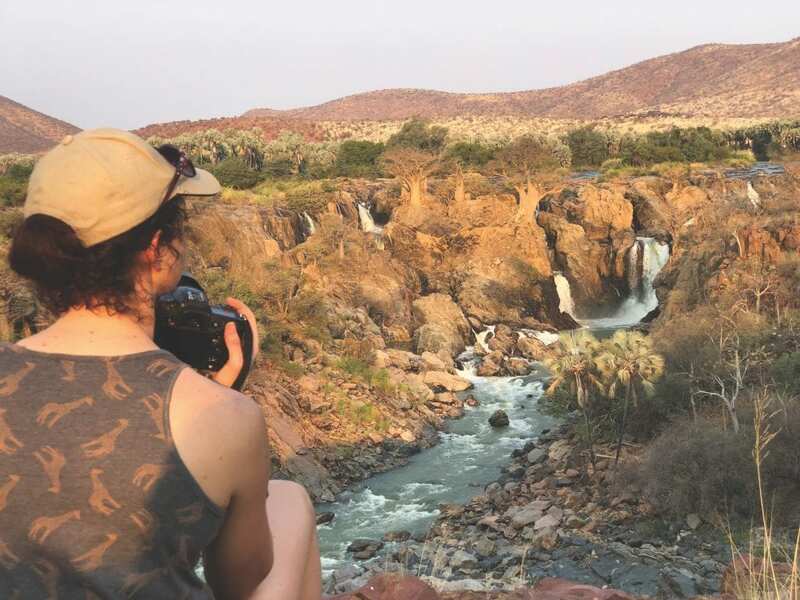 Here visitors have a unique opportunity to become acquainted with the mountainous vegetation of northern Namibia, most of which is conveniently concentrated along the hiking trail up the hill behind the chalets. 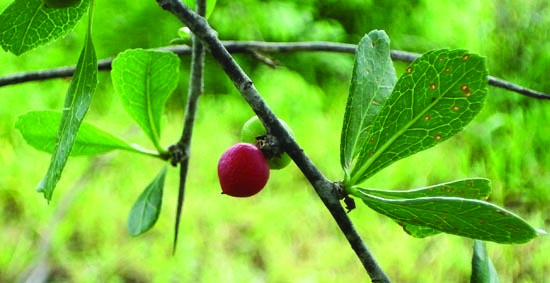 Forty-seven shrub and tree species have been tagged, four of which are either exotic or occur naturally only in South Africa. Right along the entrance road you are greeted by the somewhat spooky Herero sesame bush (679) (Sesamothamnos guerichii), related to the plant from which sesame seed is derived. 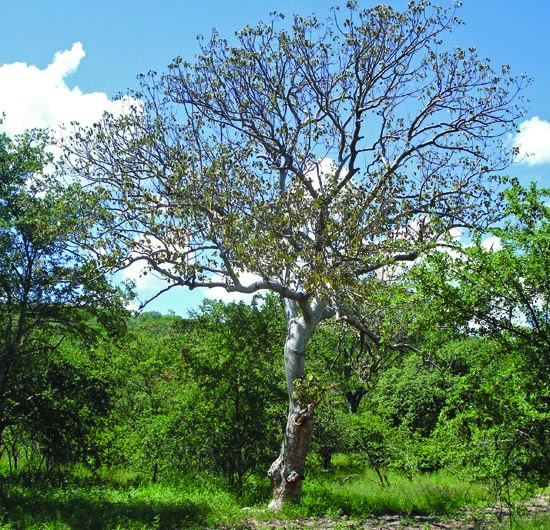 The bottle tree (648) (Pachypodium lealii) is easily identifiable by its bottle-shaped smooth trunk, while the spreading African star-chestnut (474) (Sterculia africana) has a lovely smooth white bark with purple patches that peels to reveal a green under-bark. You may have noticed trees with straight white trunks on other hill slopes – they belong to the carrot tree (569) (Steganotaenia araliacea) – and have beautiful bright-green, hanging leaves with finely-toothed margins. The resin trees, typically emitting a resinous scent when crushed, are represented by the common resin-tree (375) (Ozoroa paniculosa). The common kirkia (267) (Kirkia acuminata) with its large well-rounded crown grows abundantly on all mountains and hills from about Otjiwarongo northwards. 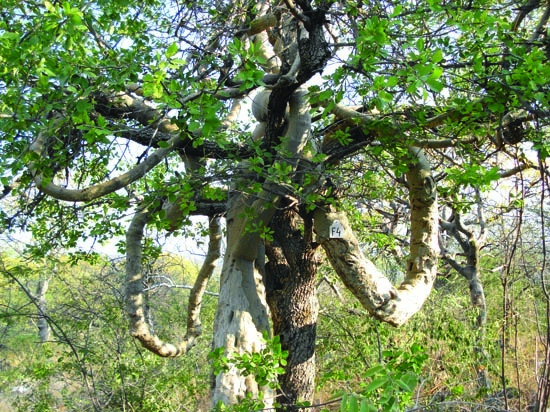 Buschfeld Park boasts many remarkable specimens of the python vine (F4) (Fockea multiflora), both as trees and as stranglers, with long sinuous branches scrambling for some kind of support. Lesser bushbabies, tree squirrels and a large variety of birds add to the attraction of this wonderful destination. Exotic trees often found in gardens and also seen here are white-stinkwood (39) (Celtis africana), a South African species often found on streets (for example in Independence Avenue in Windhoek) and in gardens. The silky oak (A9) (Grevillea robusta) is not related to the European oak. It hails from Australia, belongs to the protea family and is planted in gardens for its orange flowers. The tree wisteria (222) (Bolusanthus speciosus), native to South Africa, makes a lovely display in spring when covered in dark-purple flower sprays. Also in spring the African flame tree or flamboyant (F9) (Delonix regia), native to Madagascar, is absolutely stunning when its bare branches are swathed in bright-red flowers.